Twas the weekend before Christmas, and all through the house everyone was going crazy, even the damn mouse! People were gathering in the dining room with care, in hopes that dinner would soon be served there. Our friends were chatting amongst themselves, while hubby and I played the cooking elves. Instead we served bowls of Bucatini Americaiana, followed by braised pork belly, and then played Pollyanna. In a small saute pan, heat the whole spices over low heat, occasionally stirring the spices with a wooden spoon, 5-8 minutes. Add the cinnamon and paprika and cook the spices for an additional minute. Allow to cool for a few minutes and then grind them coarsely in a spice grinder. Mix in the salt. The spice mix will keep for at least 1 month. To marinate the pork: Rub the pork all over with olive oil. Sprinkle the spice mix evenly over it on all sides. Wrap it well in plastic wrap and let it marinate in the refrigerator for at least 24 hours and up to 36 hours. To cook the pork: Heat the oven to 325. Place the pork, skin side down, in a heavy roasting pan and cook for 1 hour. Meanwhile, heat a couple tablespoons of oil in a medium saute pan over medium low heat. Add the onion and cook, stirring occasionally, until soft and thoroughly browned, 25 minutes. Turn the pork over and add the onion , chicken broth, and reduction to the pan. Reduce the heat to 300 and cook the pork until it is very very tender, another 6-7 hours. When the pork is fully tender, you will be easily able to pull any bones right out. Remove the belly to a sided sheet pan and gently pull out any bones and any cartilage, without disturbing the layers of the meat. Using a ladle or large spoon, spoon off the thick layer of clear liquid fat floating on to of the broth and pan juices. You should be able to remove a few cups of fat easily this way. strain the mostly defatted braising liquid into a large saute pan. When the meat is cool enough to handle, use a sharp knife to remove the skin, leaving the layer of fat below intact. Heat the oven to 350. Using a large chef's knife, cut the meat into serving pieces 11/2-2 inches square, between 3-4 ounces each. 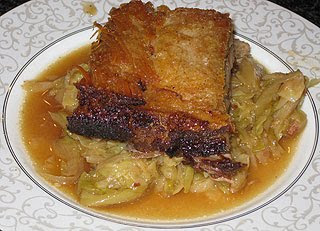 Remove any remaining fat from the surface of the braising liquid and pour about 2/3 of the liquid into a roasting pan. Heat a couple tablespoons of oil in a large saute pan over high heat. Season the fat side of the pork belly with salt and pepper and put the pork pieces in the pan fat side down. Cook them undisturbed until well browned, a few minutes at least. You are not trying to render all of the fat. You are just trying to create a crisp top. Place the pork pieces seared side up in the roasting pan with enough of the strained braising liquid to come 1/2 way up the side of the pieces. Heat the meat and liquid together in the over for 15 minutes. If the pieces of pork have lost some of their crispness due to moisture in the oven, recrisp them in a dry hot saute pan, before serving. Serve on top of cabbage and spoon sauce around. Slice the cabbage thinly to yield about 9-10 cups shredded cabbage. Set your oven racks to accommodate a large pot and heat the oven to 350. In a large ovenproof pot, heat the oil over medium heat and saute the bacon until they render some fat, 5 minutes. Add the onions and cook until tender and beginning to brown. Add the cabbage, increase the heat to medium high and cook tossing the cabbage with tongs until it wilts and begins to take on some brown color, 8-10 minutes. Add the wine and broth and cook uncovered on the stove for 5 minutes. Over the pot and cook the cabbage in the oven stirring it occasionally until very tender about 2 hours. Reserve the bacon and serve. Cute post, wonderful food! Merry Christmas to you and your hubby! That is an adorable poem you came up with! Looks like you guys had a fantastic dinner party. Wish I could have been there to eat that delicious food. Love the poem... and the food!!! Have a wonderful and blessed holiday! Your little poem was so cute. Very creative! Your meal looks wonderful... who doesn't like braised pork belly?! That was a fantastic meal. And don't forget your delicious black garlic and olive bruschetta! Everything was just as delicious as it looked. Thanks as always! Cute poem and fantastic food! Merry Christmas! 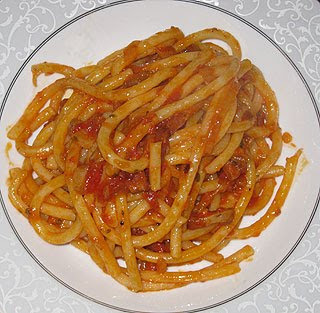 Your Bucatini Americaiana looks so yummy! Merry Christmas!